I’m really delighted to show through my income reports that ordinary people can make a decent passive income online. So I asked my email subscribers for all their doubts about whether they could earn regular, sizeable, passive income online. I got a great response. And, if you filled out that survey a few months ago, thank you very much. 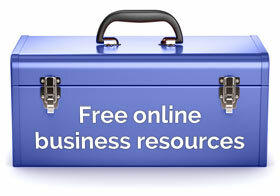 Do you think you don’t have enough expertise to sell e-books and video courses? Well, listen to me. You can do it. You are an expert and people will pay for that expertise. We,re all on a journey, although we’re not all of the same journey nor travelling in the same direction. Some people are ahead of us and some people are behind. The beauty of the internet is that you can always find people who’re just behind you who can therefore learn from you. I put a few WordPress videos up on Udemy and they started making money. I,m far from being a WordPress expert and yet people buy my courses because I tell them exactly what they need to know and no more. I sincerely believe that everyone is an expert. Everyone is useful. People are worried that they don,t have the time to create products so that they can earn passive income online. Remember, this is a side hustle, a part-time project. I run a web and graphic design business that provides services for clients. I started creating the e-books and video courses in my spare time. I only spend an hour a day either writing an e-book or creating 5 minutes of video. I also write a blog post every week and maintain an email list. You do have the time to do this. People believe that creating and selling e-books and video courses is technically very difficult. At first, it’s best to sell video courses on online learning platforms – Udemy, especially, but there are others such as Skillfeed and Skillshare. They do the video storage, course delivery, payment gateways, tax (and that includes the latest EU VAT laws), affiliate schemes, commissions, coupon codes, student support, marketing, everything. All you have to do is to create the course. It’s the same with Amazon, I sell e-books through the biggest bookstore in the world. They know infinitely more about selling books than you or I. In terms of the technical details behind creating e-books, this is amazingly easy as well. You can write a Kindle or any e-book using Microsoft Word or OpenOffice. Video courses can be created using only one tool (either Screenflow for Mac or Camtasia for PC) which records your voice and computer screen, these applications also edit and export HD video via super-easy, intuitive, drag-and-drop interfaces. So, you can earn passive income online with very limited technical ability. A lot of people think they don,t have the money. But you don’t need much money at all. As we’ve seen, you can write an e-book using Microsoft Word or Open Office. You can sell it on your own site by using a service like Gumroad. The money will go directly into your PayPal account with Gumroad taking a small commission. So, it costs nothing to sell e-books from your own site. It costs nothing to sell from Amazon either although you may like to outsource the cover creation and text editing of the Kindle. This would cost $150 at the most. For video courses, as already explained, you just need to buy screencasting software and a decent microphone. You could create dozens of video courses that earn you tens of thousands of dollars with only $200-300 expenses! A few hundred dollars may seem like a lot of money but the benefits of creating and selling your products will far outweigh the cost. Some people would be embarrassed to be associated with info-products because of their scammy and spammy reputation. I can understand this. Some internet marketing products promise the earth, cost a lot and deliver very little – and are sold by some dodgy guy standing in front of a Mercedes Benz! However in terms of e-books, many respected entrepreneurs have published Kindles on Amazon. And in terms of video courses, for example, Seth Godin has three courses on Skillshare and Guy Kawasaki has one on Udemy. So there is nothing to be embarrassed about. I advocate to only create products on subjects you know about. And make your content to be of the highest quality. Some people don’t want their bosses or co-workers finding out that they are selling products online. If this is the case it is possible to do this completely anonymously. Setting up a pseudonym at Amazon is no problem because lots of people use pen names – you still use your personal Amazon account and no one will know. If you’re thinking of taking money from PayPal you should set up a business with email and then you can take payment anonymously. But you’ll have to do everything under your pseudonym online – blogging, commenting, social media – the lot. So this may lead to a few practical difficulties but it’s not impossible. Having a product for sale increases your reputation within your area of expertise. It can enhance your reputation at work. And lastly, people are held back by the thought that they don’t have the motivation. They find it hard to get things done, especially with all the shiny objects and distractions we have online these days and the day-to-day business of having a job and a family. But I am super-lazy, unfocussed and ill-disciplined and yet I managed to write 3 Kindles are create 4 video courses last year. I,ve just got in the habit of writing one blog post a week (which isn,t very much) and spending an hour or so, every day on either a book or a course. So everyday I write 500-750 words and at the end of a month I,ll have a Kindle book finished. Or, I spend an hour creating at least 5 minutes of video a day (that,s 10 minutes or so to shoot it and an hour or so to edit it). And again, at the end of a month I,ll have a video course completed. There is nothing like the feeling of seeing your products being sold and reading positive reviews about them. You,re making money, enhancing your reputation, growing a personal brand, and … you’re helping people. There’s no better motivation than that! No excuses! I don’t care who you are: young, old, educated, un-educated, inexperienced or over-qualified. You can do it. You can sell e-books and video courses and make passive income online. You just need to find a subject you’re passionate about. See the exact step-by-step processes that makes me over $5000+ each month passive income in my new course Earn $5000+ a Month Passive Income Selling E-books and Video Courses. You can see exactly where I make my money, learn how you can sell your expertise this way, and, how you can both make money as well as generate new leads at the same time. It’s nice to know I’m not the only one. Great post Rob – I love your “can-do” attitude. You never know what you can do until you try. I’ve just completed a 30 day blogging challenge and I would have not believed I could do that until I made myself take a shot at it. Of course the support and encouragement of other people doing the same helped, but I still had to do the work. That 30 day blogging challenge sounds really good. If you show yourself you can do something, you’re right, you see for yourself you have no excuses and that’s so powerful. Thank you for the comment, Claire. The list continues! The truth is .. stop giving excuses and work it out. Trust me, the results (after some good time and effort) are always awesome. Trust me on that and good job. Great to see you in the comments again, Reginald, and you’re someone who’s put out lots of content himself and so it’s been a while since you entertained any of those doubts. So glad you’re seeing the results and you’re doing so well. Thank you for the comment, Reginald. I started less than a couple of years ago and in 2014 I earned about $350 a month on average. Time: 24h, like everybody else on this world (if you wonder… 9 to 5, 4 hour commute, family, 3 kids and a church community to divide my time among). Technical ability: so-so; I’m not afraid of exploing new tools. But some things are just beyond me. I spend more than 20 hours trying to learn how to format a manuscript for Create Space. In the end I just outsourced it. Money: I published my first ebook for $5. Not the wisest decision I’ve made. Like Rob says, it’s better to invest into solid product upfront. People at work finding out: now, this is interesting. If you put my name in Google, the first page is mine: Amazon profile, Goodreads, my blog… No one gives a s**t.
Motivation: results doesn’t come from motivation; they come from action. Just do it. Hey Michal, thank you for that comment. So glad you wrote it because you have three kids which is three more than I have so you can counter that possible argument against me. 🙂 People do say that the job plus the commute plus the family means they have no time but you prove them wrong. And, Steve Jobs, Bill Gates, Elon Musk, they all have/had families (Elon Musk has 6 kids!) and they’ve all done it. Wow Rob. You really know how to connect with your readers. Doing this page was a real smart idea. My favorite line is “…I am super-lazy, unfocussed and ill-disciplined and yet…”. I too am trying to write an eBook, my very first one. I have all of these excuses and more. I did start, I did write a few pages. I am a little embarrassed to see my words of excuse on this page, but after recently reading many of your posts and the posts about your income, I am more inspired to continue my eBooks. I am also thinking of a series of eBooks, all in the sane niche. By the way, I like it when you say “You can do it”. I think it’s on all your posts. It’s great seeing it at the end of each posts. It really does encourage me. I will let you know when I finish my first eBook. 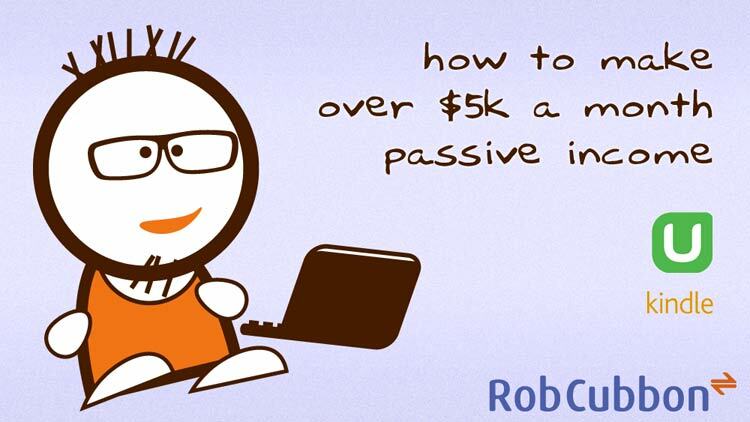 Rob: thank you so much for all the work you do, and thank you so much for sharing your income, what you have learned on your “passive income” career. By the way, I have purchased some of your eBooks and Udemy videos. Keep up the great work. I love them. Thanks for your great teaching. I like the way you speak in your Udemy videos. It’s very casual and very instructive. Hi Rene, thank you for your kind words. I’m delighted that you find my content, both free and paid useful. Not many people notice that I usually put “You Can Do It” as the last subheading in all my blog posts. I’ve been doing it for years! haha! I wouldn’t feel bad or “feel embarrassed to see my words of excuse” – they’re not excuses, they are doubts that we all have. 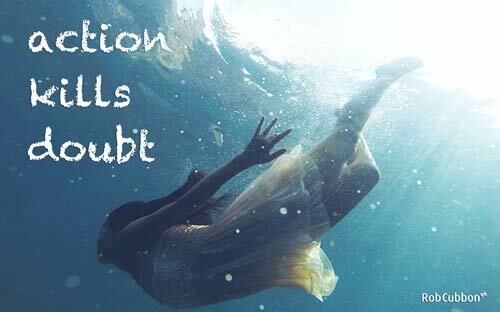 All human beings doubt themselves and it’s nothing to be embarrassed about but we should constantly remind ourselves that action kills the doubts. That sounds quite good. I think I’ll write a blog post about that. Thank you for your comment, Rene. Wow Rob. “… they’re not excuses, they are doubts that we all have. All human beings doubt themselves and it’s nothing to be embarrassed about…” That’s beautiful, very moving. I am deeply touched. Thank you, thank you very much. If you do write a blog post on this, let me know. I would like to read it. Very encouraging post, Rob! I especially like the way you share your shortcomings alongside your successes in your posts. What worked for me was setting “mini-habits” for content creation to get the ball rolling, and then becoming a little more active on social media to get some much needed accountability. That’s all I have to say for now. Cheers! P.S. I’m looking forward to starting on your “Learn & Earn” course this coming week. Hey Patrick, thank you for the comment. Yes, it’s interesting a lot of people have singled out that comment I made about being lazy, undisciplined and un-focussed. It’s true, I am! The “mini habits” help, as you suggest. And taking one thing at a time. That is so spot on! And, this is why when a blogger, author, instructor, etc. (which you are all those and more!) responses and posts in the comments section, it is worth reading them, as well, because there can be ‘jewels’ in there too. Haha, thanks Kimberly, the comments can be very enlightening sometimes. I was inspired by Michal’s comment: “results doesn’t come from motivation; they come from action”. I even created a social media image about it!